Gift Certificates are perfect for the fisherman or woman. 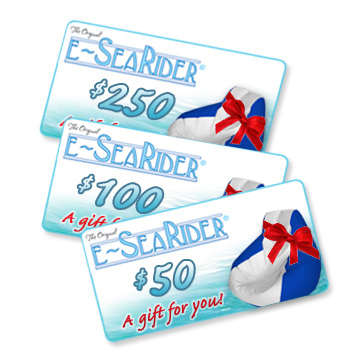 With the E-Sea Rider%copy; Gift Certificate you're chosen quality and comfort they can choose the style and colors. The perfect combination, the perfect gift. 2) Click the "ADD TO CART" button. 3) If you want to add more cards/money, use the quantity selector. Incremented by $25.00 per single quantity. Gift Certificates are a great way to give the gift of comfort to your favorite fisherman or fisherwoman.